From conflict zones to airports to sporting events, bombs pose dangers for innocent civilians as well as the bomb technicians who regularly risk their lives to investigate suspicious objects and render the devices safe. Technology solutions can help first responders to see hidden dangers. To this end, the DHS S&T’s First Responders Group (FRG) is developing the X-Ray Scanning Rover (XSR) to be a responder’s eyes. It quickly and accurately scans packages and bags for leave-behind improvised explosive devices (LBIED) while keeping responders out of harm’s way. Unlike most existing scanners that use pulsed X-ray energy for detection, the XSR robot features a continuous, fan-shaped operating X-ray beam, permitting a higher degree of penetration through dense packaging. S&T says that while other handheld scanning systems require multiple images to be stitched together, the XSR provides a complete 3-D, multi-view picture of the entire object being scanned in real time, saving first responders precious time. This technology offers an alternative to other large, bulky, expensive options that may have limited ability to operate in remote areas or rough terrain. 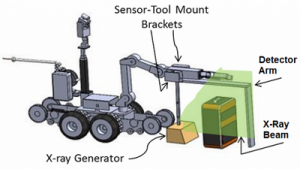 The XSR meets another requirement of the bomb squad community by embedding the detection technology within the bomb squad’s current robotic operating systems — this means they don’t have to buy an additional robot. Whether being used at a roadside checkpoint, a national landmark, or at a public gathering, the XSR deploys easily in multiple environments to provide security screening when needed. S&T notes that FRG met with subject matter experts in August 2015 for a critical design review. The feedback obtained from the review will be incorporated into two new prototypes, which FRG expects to be ready by summer of 2016. The prototypes will be delivered to selected bomb squad units across the U.S. for field testing.